SMAP member Kusanagi Tsuyoshi (34) yesterday returned to work for the first time since his arrest for public indecency last month. He and the other four group members recorded an episode of the Fuji TV variety show “SMAPxSMAP,” which will be aired June 1, and Kusanagi recorded a narration for today’s edition of the music show “Bokura no Ongaku.” This afternoon he returned to his regular slot on the live variety show “Waratte Iitomo.” Wearing a somber black suit, he apologized to the host, comedian Tamori, the other regulars and the studio audience. After the show he gave a brief press conference where he again repeated his apologies and expressed thanks to everyone who supported him over the last few weeks. The speed of Kusanagi’s return to work after such a big scandal is an indication of his commercial value, and he will appearing in his various commercial roles once again from next month. • Love, and possibly marriage, is in the air for popular model and talento Ebihara Yuri (29), according to today’s issue of weekly magazine “Friday.” The magazine published photos of her on a date with Ilmari (33) of the hip hop group Rip Slyme. Not only were they visiting the famous Aoshima Jinja shrine in her home prefecture of Miyazaki, known for its powers of bringing people together, but they were accompanied by Ebihara’s family. Local heartthrob Kimura Takuya (36) joined Hollywood counterpart Josh Hartnett (30) and Korean star Lee Byung Hun (38) last night for the world premiere of “I Come With the Rain” in Tokyo. The actors were in Roppongi at the Tokyo Midtown complex for the event, also enjoyed by an invited audience of about 1,000. The movie is directed by Vietnamese-born French director Tran Anh Hung, who is currently working on the eagerly awaited movie version of Murakami Haruki’s cult novel “Noruwei no Mori” (Norwegian Wood). It is scheduled to open in theaters on June 6. SMAP’s Kimura talked about the tensions of filming in one of the more unsavory areas of the Philippines under the watchful eye of the local military. The movie was also filmed on location in Los Angeles and Hong Kong. • Comedian Horiuchi Ken (39) has married a woman 17 years his junior, he revealed yesterday while filming an NTV variety show. After the show, he held a press conference and was joined by the other two members of popular comedy trio Neptune, Nagura Jun (40) and Harada Taizo (39). HoriKen was previously linked with actress Igawa Haruka (32) in 2003. Call it the not so funny side of the comedy business. In an ongoing case of intimidation and violence that has led to police involvement, Japan’s top comedy talent agency, Yoshimoto Kogyo (profile), today said that they recently sent an analysis of the handwriting of one of their veteran comedians to Osaka Prefectural Police. The handwriting in threatening letters sent to the home of another Yoshimoto veteran, Nakata Kausu (59. Photo, left), was said to resemble that of Maeda Goro (67. Photo, right). The company asked an expert to analyze Maeda’s handwriting after police spoke with him on May 15, said Yoshimoto Creative Agency president Minakami Seiji. Yoshimoto yesterday announced that Maeda was taking indefinite leave of his professional duties, though they stopped short of saying that Maeda was guilty of any crime. Maeda and Sakata Toshio (67. 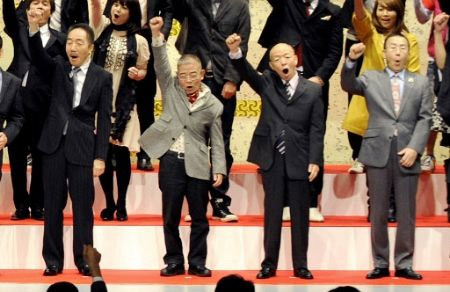 Photo, second from right) have been performing as the manzai duo Comedy No.1 for more than 40 years, but are said to be hardly on speaking terms. Yoshimoto said yesterday that Sakata is to continue appearing solo. Nakata made his debut in 1969 as one half of the manzai duo Nakata Kausu-Botan but in recent years has drawn criticism for his association with a yakuza (organized crime syndicate) boss. The recent news sheds some light on a case involving threats and physical attacks against Nakata. He was slightly injured in Osaka back in early January when a man with a metal bat attacked him as he sat in the passenger seat of a car stopped at a traffic light. The following day a threatening phone call was made to a Yoshimoto theater where he was appearing, with the caller giving his name simply as Yamamoto. Last month letters signed in the same name arrived at Nakata’s home promising to hurt him so badly he wouldn’t be able to take the stage. Japanese contenders have come away empty handed from this year’s Cannes Film Festival. Koreeda Hirokazu’s “Kuki Ningyo” (Air Doll), about a video store clerk falling for an inflatable female doll, was shown in the Un Certain Regard category but failed to take the prize. There were no Japanese entries this year in the main competition category. But “Map of the Sounds of Tokyo,” a Spanish film directed by Isabel Coixet and starring Sergi Lopez (photo left) and Kikuchi Rinko (photo right), got a rapturous response from the audience when it was shown at the main theater on Saturday. Kikuchi, at Cannes for the first time since the release of “Babel” in 2006, was in tears as the film got a 5-minute standing ovation. “I was cool watching it part way through, but memories of the filming started coming back to me. It was a tough movie for me.” Set in Tokyo, the movie features both English and Japanese dialog. 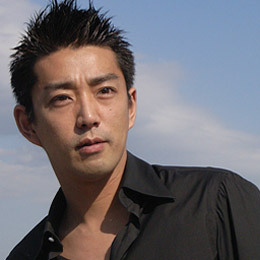 Kikuchi plays a fish market worker who’s an assassin on the side. • Management for Miyazawa Rie (36) announced on Saturday that the actress gave birth to her first child last week. She had the bouncing baby girl at a hospital in Tokyo, though the media had speculated the birth would happen in Hawaii. Miyazawa announced her engagement and pregnancy back in February and she married a former professional surfer, who is based in the Aloha State, on April 2. • The opening episode of “Mr. Brain” pulled in a respectable audience rating of 24.8% on Saturday. The TBS drama series drew high expectations with hit maker Kimura Takuya in the lead role of a forensics researcher. The series boats an all-star cast, with appearances from the likes of kabuki star Ichikawa Ebizo, actress Hirosue Ryoko and musician Gackt. • On Saturday, Japanese wadaiko group Kodo performed with the prestigious Accademia Nazionale di Santa Cecilia Orchestra in Rome for an audience of about 2,500. Seven members of the group joined the 80-member orchestra in performing Monoprism, composed by the late Ishii Maki. The seven wore the group’s distinctive traditional happi coats and hachimaki headbands. The popular group, based on the island of Sadogashima, tour around the world for several months every year. Since their debut in 1981, they have performed about 3,200 overseas concerts in 46 countries. In the latest celebrity drug trial, songwriter Sonoda Ryoji (33) was handed a suspended 18-month prison sentence today at the Tokyo District Court. It was Sonoda’s first courtroom appearance and as he had admitted to the charges and shown suitable remorse, the judge wasted no time in handing down a sentence. Sonoda, who has written such hits as SMAP’s “Kimi wo Suki ni Natte” and BoA’s “No.1,” was arrested in late April for use of “kakuseizai,” or stimulant drugs. In the arrest report, the Azabu department of the Tokyo Metropolitan Police said that they had found him using a small amount of the drug at a hotel in the Shinjuku district of the capital on April 22. Sonoda said he had bought the drugs for ¥38,000 from a man he contacted via the Internet, and that he had been a user for about a year and a half. Some happy marriage news. Management for comedian Ishii Masanori (36, photo left) announced yesterday that he just got married. The diminutive funny man, who is just 158cm (5’2″), married a fellow Yokohama native (31) who is even smaller, at 147cm (4’10”). They chose yesterday, which was an auspicious taian day in the traditional Japanese calendar, to tie the knot. Ishii had the day off and went by himself to the local municipal office to register their marriage. The couple first met through a mutual friend in June 2005 and started dating the following November. Ishii rose to fame as the short half of comedy duo Ari to Kirigirisu, though these days he works more as an actor or solo talento. His comic partner Ishizuka Yoshiyuki (33) said, “It’s his second marriage so I won’t be giving him any congratulatory money!” Ishii was married to comedienne Kamemura Ai from 1998-2005. Meanwhile, freelance announcer Yamada Rena (31, photo right) is engaged to a fellow Keio University graduate, it was revealed yesterday. Yamada was chosen as Miss Keio 1997 and later joined the TBS network, where she was the weather announcer on the “News23” show. She plans to continue working after her wedding, which the couple plan to hold at a Tokyo hotel in the near future. 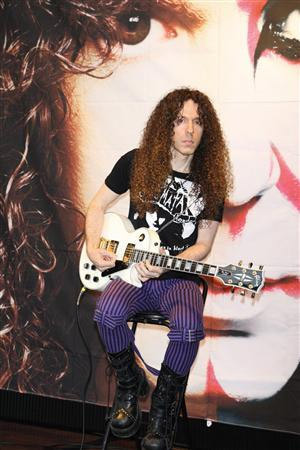 Former Megadeth “charisma guitarist” Marty Friedman (46) has been unashamedly gushing about his love of the J-pop scene for a few years now. And today he’s cashing in on the mismatch of heavy metal axeman and sugar sweet pop music with the release of “Tokyo Jukebox,” an instrumental album of J-pop covers. Friedman performed a few guitar licks for reporters at the Tokyo Tower observation deck yesterday, including his take on Mr. Children’s “Gift” and a little enka in the form of Ishikawa Sayuri’s “Amagigoe.” Friedman performed as a member of Megadeth during their most successful decade from 1990-2000. After moving to Japan, he joined X Japan guitarist Pata and Luna Sea drummer Shinya as a backing musician to rock singer Aikawa Nanase in 2005. A more unlikely pairing was with J-pop star Suzuki Ami on NHK’s “Kohaku Uta Gassen” that New Year’s Eve. He also performed last year on a mini-album of covers by African American enka singer Jero. In March, he performed Bach’s Brandenburg Concerto with the Tokyo Symphony Orchestra. A famous Friedman anecdote is that he auditioned for legendary rockers Kiss, but was turned down because he was under six feet tall. 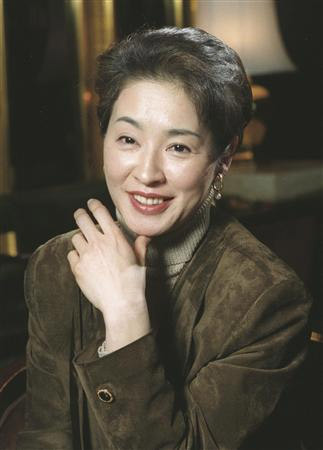 Former TV announcer Yorichika Mitsuko died yesterday of cancer-related heart failure at a Chiba Prefecture hospital. She was 53. She is regarded as the first announcer to become an “idol” in her own right, establishing a trend that still continues today. Yorichika joined NHK in 1978 and within two years was hosting the “Terebi FaSoLaTiDo” variety show with popular talentos such as Tamori. Real name Shikanai Kasareen Mitsuko, she was born in Hiroshima and learned piano and cello from an early age. Her father was a Japanese-American and she attended the Tokyo University of Foreign Studies. With her exotic looks, fluent English and professional level musical skills she was regarded as Miss NHK and was the first female announcer to host a variety show on the network. In 1981 she left NHK for Fuji TV, a rare move at the time, and appeared as an assistant presenter on the “Ogawa Hiroshi Show.” She later became a newscaster on the late-night “FNN News Report 11:30.” She quit TV in 1984 after marrying Fuji TV vice president Shikanai Haruo, with whom she had two children. But her husband died in 1988 and she returned to TV in 1993. She made her acting debut in the 1996 NHK taiga historical drama “Hideyoshi.” She was regularly involved in the classical music scene, as a concert planner, emcee and magazine writer. She was diagnosed with esophageal cancer two years ago, but chemotherapy treatment allowed her to continue working until as recently as last month. She was hospitalized a week ago and developed pneumonia last Friday. • We reported yesterday on measures Avex were taking to prevent the spread of swine flu at concerts this week. But they announced last night that they were going one step further and canceling shows by Hamasaki Ayumi, Koda Kumi and Otsuka Ai. The six shows were all scheduled over the next few days in the Kansai region cities of Osaka and Kobe, where recent flu outbreaks have been concentrated. Show business organizers have started taking measures to deal with the surge in swine flu cases in Japan over the last couple of days. With the flu seemingly arriving in Japan with school kids who’ve been studying in North America, schools have been closed in the Kansai area where the cases have been concentrated. J-pop concerts and other events where teenagers would gather in large numbers are also an obvious risk. One of the biggest record labels, Avex Group Holdings, said they would ask concertgoers to disinfect their hands at venues this week. They will also provide iodine mouthwash in toilets and provide face masks for anyone seen to be coughing or sneezing. Avex have upcoming concerts by several major artists: Hamasaki Ayumi (May 20/21) and Otsuka Ai (May 23/24) at Osaka Castle Hall, and Koda Kumi at the Kobe World Kinen Hall (May 23/24). The Kobe venue is also scheduled to host Dreams Come True and Mr. Children this month. Another high profile organization, Johnny’s Jimusho, announced that they would be postponing concerts in the Kansai region. The group Kansai Johnnys Jr. were scheduled to play four shows over two days at the Umeda Geijitsu Gekijo theater in Osaka on May 23-24, but the shows have been indefinitely postponed. Johnny’s say they will notify the 7,600 ticket holders when new dates are decided. Actress Fujiwara Norika was scheduled to attend a Red Cross event at her old high school in Kobe tomorrow, but it has been canceled.